For all my bluster about eating locally and seasonally, I also get really excited about exotic imports. 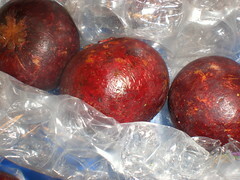 When I saw this articlein the NY Times about the legalization of mangosteen imports, I knew I had to have one. Having fallen in love with longans while I was in Vietnam, tropical fruits have a special place in my heart. I saw mangosteen juice at the local market, but it wasn’t the same. Then a co-worker started asking about mangosteens (she saw the juice as well). 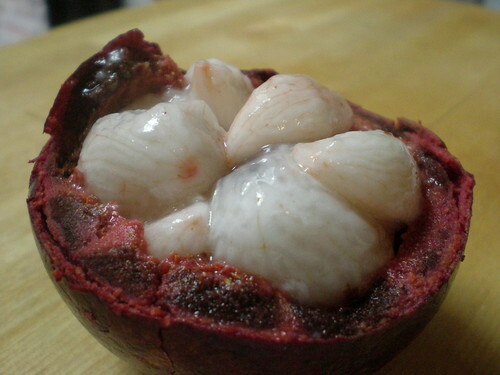 Finally, Ed Levine posted his encounter with mangosteens, and I felt like all of the pieces had fallen into place. It was time to get mangosteens of my own. I ordered the mangosteens from Frieda’s, a specialty produce company (the same place Ed Levine got his). I had them delivered to my work so my co-worker could have some as well. Because mangosteens are so perishable, they require a surcharge for overnight delivery, and they arrive sealed with cold packs in with the fruit. I immediately set to work opening one up. All I had at the time was a plastic knife, and cutting through the red outer husk was not easy. When I finally got it open, I peeled back the husk to reveal the translucent, slimy lobes of fruit within. With much anticipation I scooped out one of the cold, soft pieces with my fingers, and slid it into my mouth. 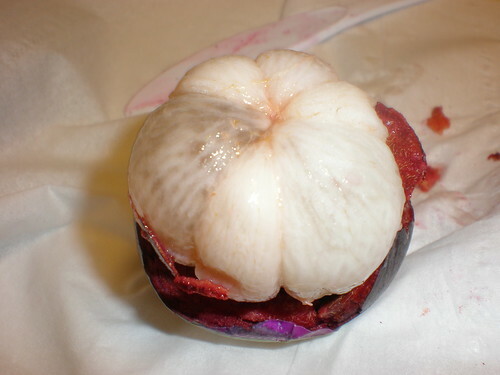 Mangosteens have a unique taste and texture. Not really like mango at all, they do taste a little like passion fruit — sweet and tart, juicy and slimy and wonderful. They are so delicate that they are almost ephemeral, and yet the taste is so assertive that there’s no question as to why mangosteens are often called “the king of fruit.” I like this photo because the fruit got a little disturbed as I was opening it, and the lobes look almost exactly like eyeballs.With the overnight shipping, the case of 11 mangosteens (Frieda’s promises 9-13 fruit in each box) costs $40, or a little under $4 each. At that price they are still a luxury, but not out of reach. I look forward to ordering more mangosteens in the future, but only for special occasions.